Gadaladeniya, Lankatilaka and Ambekke are architectural wonders from a bygone era. All these places are located close to Kandy and are must-visit sites if you are interested in exploring the country’s past. Ambakke Devalaya which is dedicated to God Kataragama is the best place in Sri lanka, to see the finest wood carving work. Prominent carvings among these masterpieces are the entwined swans, double-headed eagles, wrestlers, tangled rope designs, breast-feeding image, a fighting soldier, a figure of bird-human mix, a figure of elephant-bull mix and elephant-lion fusion, all in all close to 514 unique designs. The roof of Ambakke temple is an excellent example of ancient wooden architecture The Ambakke Temple was built in 1371 by King Wickrama Bahu III. If you are coming along the Colombo-Kandy Road, you need to turn from Pilimathalawa to reach Ambakke. This Devalaya is located in the same road which goes via Gadaladeniaya Temple. It’s a fascinating place associated with myths and legends. They are associated with Princess Hena Kanda Biso Bandara, who was born of a Beli fruit and later became a partner of Wickrama Bahu. She was an ardent devotee of God Kataragama. Except for the Shrine, the rest of the temple is made almost entirely of wood. 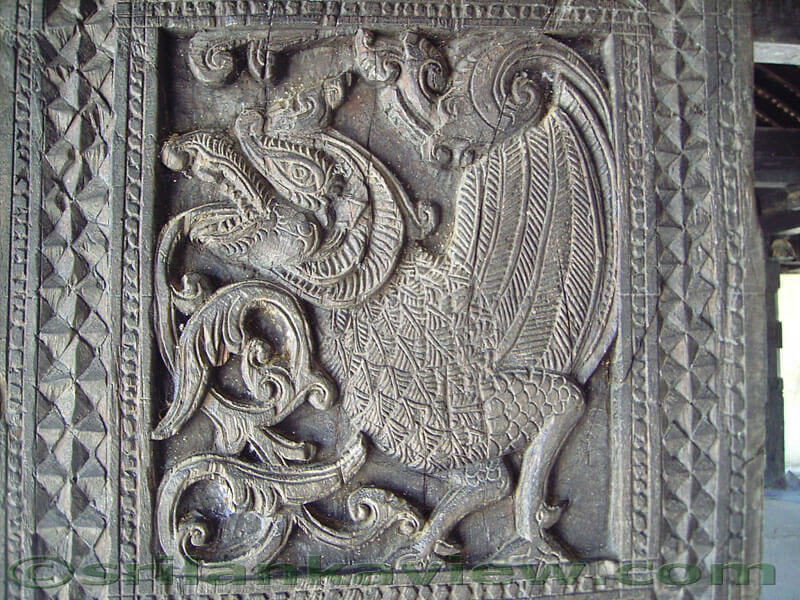 From carved wooden pillars and beautifully crafted roof, the entire place is covered in carvings. The pillars have various images carved into the sides of the bases. This is definitely a unique place that you must not fail to see if you are interested in history and fine delicate works of art. Ambakke Devalaya is located approximately a 45 minute drive away from our bungalow and other hotels in Kandy. Make sure to ask our team at Amaya Hills, Hunas Falls or at Amaya Bungalow to arrange an excursion for you.